For the Holidays, I was gifted a subscription to Cooking Light Magazine. 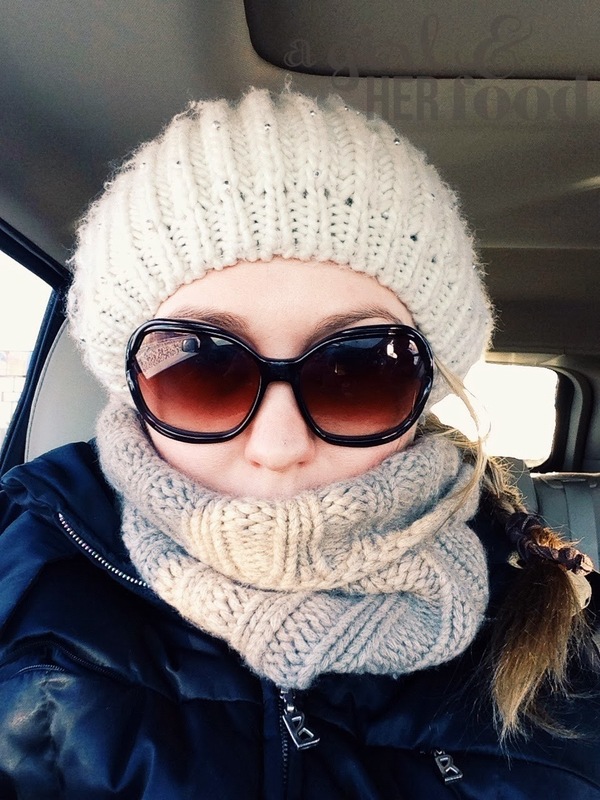 I was immediately drawn to the hearty beef & stout stew recipe due to Chicago’s arctic temps (-17 degrees). Making the recipe even better, is the kale mashed potatoes it is paired with. This recipe reminds me of my favorite, beouf bourguignon, which I make all the time in the Winter for SNS (Sunday Night Supper). I altered the magazine's recipe by using whole pearl onions in place of finely chopped onion (just as I use for my beouf bourguignon). Also, The Cooking Light recipe called for presliced cremini mushrooms, which saves prep time, but you will never find anything presliced in my grocery cart. I went for organic cremini mushrooms. They were so small that there was no need for me to slice them. This stew is hearty and filled with aromatic vegetables, herbs, and deep flavored sauce. Sprinkle beef with salt and pepper. Heat a large skillet over medium high heat. Add 1 tablespoon olive oil to pan, ( I used my medium sized dutch oven) and swirl to coat. Add beef to pan, and cook for 3 minutes, browning all sides. Remove the beef from pan. Add the remaining 2 teaspoons oil to pan, and swirl to coat. Add the onions, carrot, mushrooms and thyme sprigs; saute for 4 minutes. I let the onions brown lightly before I continued to add tomato paste and minced garlic; saute for 1 minute. Add beer; cook 1 minute,scraping the pan to loosen browned bits. combine beef stock and flour in a small bowl, stirring with a whisk. Add stock mixture to pan. Cover, reduce heat, and simmer for 15 minutes. Stir in the beef, cook 1 minute or until thoroughly heated. Stir in soy sauce. Discard thyme sprigs. 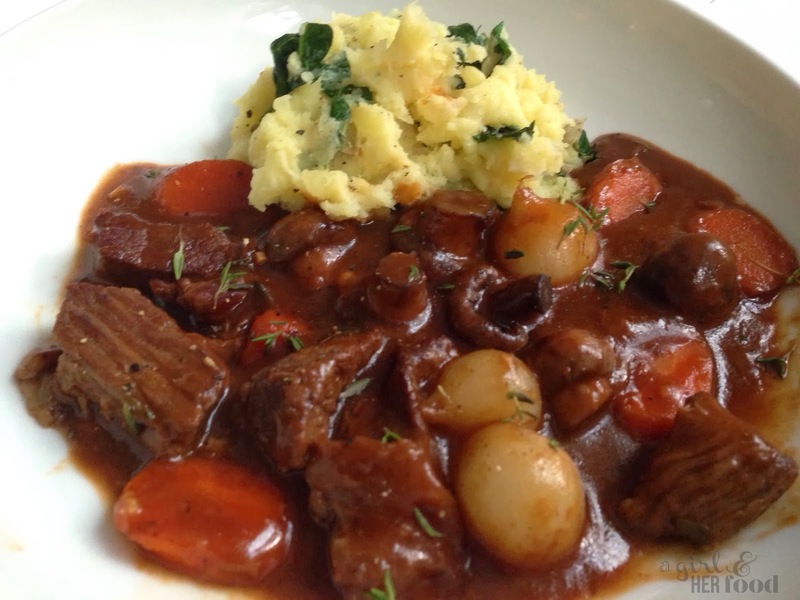 I garnish my stew with some fresh thyme leaves and serve with a scoop of kale mashed potatoes. Put potatoes into a pot with a tablespoon of salt and cover with cold water. Bring to a boil over medium high heat and cook until potatoes are tender, about 20 minutes. Meanwhile melt 1 tablespoon of butter in a large skillet over medium heat. Add the 2 cups of sliced kale and saute for about 1-2 minutes. If potatoes are done, drain them well. Toss in a tablespoon of butter and heaving whipping cream and mash with potato masher (old school style) or you can the potatoes through a ricer or food mill before adding the butter and heavy whipping cream. Add kale and stir to combine. Season to taste with salt and fresh ground pepper. Scoop the potatoes into a bowl and serve with the beef stew. Enjoy! Yum! This looks amazing! I once made a Lamb Guinness Stew from Cooking Light a few years ago and it turned out awful- I must try this now to redeem myself! I second Katie^!! 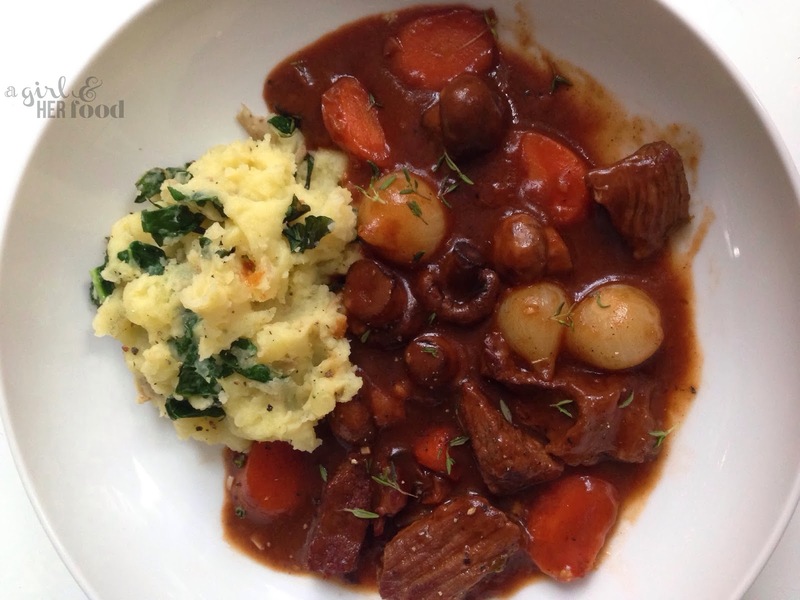 This looks absolutely delicious and I know my boyfriend would make any excuse to have a Beef Stout Stew every night. I'll have to try it!